This time I’ve got the guys from Nine Kingdoms Publications – Ivan Turner and Doug Levandowski. Nine Kingdoms is an up and coming game publisher that has some interesting games on the way. Here we go. Tom: First let’s talk about who you are and your gamer cred. Ivan: Hi. Thanks for having us on. My name is Ivan Turner. Over the years, I’ve kind of hit the whole spectrum of gaming. I got started back in the late 70s and early 80s with D&D and some of the old Avalon Hill games. In my mid twenties, I bought a stake in a comic book and game store and that’s when things really exploded. I discovered Warhammer and CCGs, among a variety of other board games. When you own a store, you demo all kinds of games. It was a really great time, because I got to see the industry from all different sides. Doug: Again, thanks for having us on. I talked to you about Gothic Doctor a while back and enjoyed it, and I’m looking forward to talking with you again! I’m Doug Levandowski, English teacher by day. I started playing D&D with guys from my Boy Scout troop, probably around 1990 and played through high school. I sort of fell out of gaming after that, but I got back into it pretty heavily about 5 years ago with the explosion of board gaming – Pandemic, Settlers, all that stuff. So, I wouldn’t say I have the highest gamer cred, but I dig that the community is really accepting of all-comers. Tom: Ivan, are you still into comics? If so which ones? Doug, do you read any? Ivan: I love the comic book medium but I don’t read very many and I’m not really into superheroes anymore. Every 6 months, I pick up the new Walking Dead TPB (I’m sure that’s a big surprise). Since comics have gone digital, I’ve been dipping into my past and rereading some of the books that got me interested. At the top of that list is the Dark Horse Aliens books. Doug: Right now, I’m reading two on-going titles: Fraction’s run on Hawkeye and Young’s work on Rocket Raccoon. Tom: I read Fraction’s first run on Hawkeye and it’s good. I’m seriously considering a Marvel digital subscription. Sure, books may be late but access to the entire Marvel library makes up for that. Are you watching Agents of Shield or The Flash? But I’m a huge Justice Society fan. Ivan: I was honestly never a big Marvel fan, at least not of their heavy hitters. Back in the 90s, I enjoyed a few of their lesser titles like Darkhawk and the New Warriors. 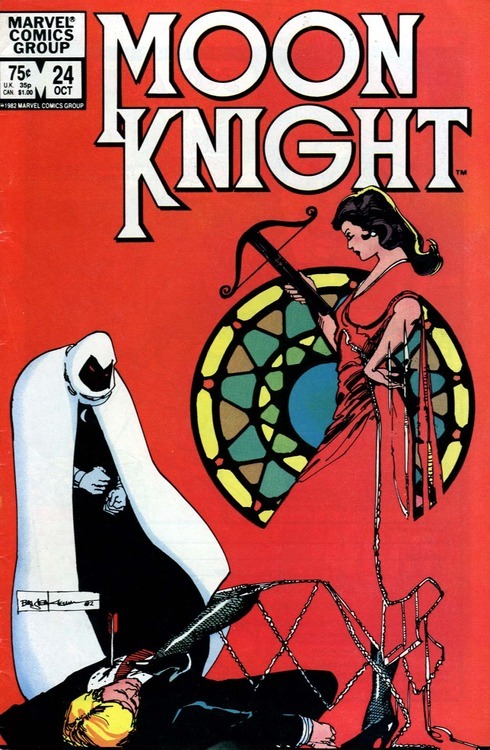 I loved Doug Moench’s Moon Knight in the early 80s. I got to meet him once, when he was busy breaking Batman in Knightfall. I was working for Jim Hanley’s Universe at the time and Doug Moench and Kelley Jones were doing a signing. We spent the entire night talking about Moon Knight. It was awesome. 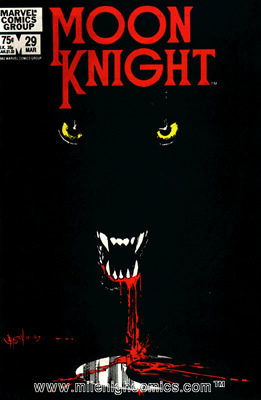 Bill Sienkiewicz’s cover for Moon Knight #29 You NEED to read this series. Tom: OH, man that sounds great. I really like Moon Knight. I started in the ‘80’s on the classic run. It was a HUGE influence on my comic art. My friend and I did a comic strip in college for the college paper. I modeled some of my art for it off of Sienkiewicz. We even wrote a Moon Knight story and pitched it to Marvel. We got a nice rejection letter. Ivan: I love the Flash, but I haven’t watched the show. Like I said, I’ve lost my taste for superheroes right now. With me, everything is cyclical, though. One day, I’m going to wake up and feel the need to inhale a whole bunch of superhero television. Good thing there’s Netflix. Doug: Oh man. In high school, I spent easily $10 a week on comics for about four years before I fell completely out of love with the genre. I started reading around when they split the X-titles, and I read those for a while, until Multiple Man “died” for the second or fifth time in, like, 3 years. After that, I said, “Screw this. This is lazy storytelling.” The only one I actually kept up with after that was Jeff Smith’s Bone. But then in college, a buddy of mine told me, “You need to read Grant Morrison’s run on X-Men,” which I did. Amazing. Since then, I’ve read pretty selectively. Preacher trades, Morrison’s original run on Animal Man, Whedon’s run on X-Men. And yes, I’ve been watching Agents since it started. The first season was rough, but after the Cap tie in, it’s been great. I told myself I’d watch Arrow on Netflix, but only when I’m running at the gym. So, in the past six months, I’ve seen three episodes. But if I ever start exercising again, I definitely want to get caught up on that and then get into Flash, too. I’ve heard great things. 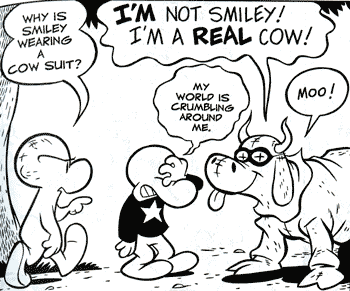 Jeff Smith’s Bone. A classic comic you should read. Tom: I’m reading Bone to my son. We’re getting the collected editions that are in color. It is such a good story. I spent about $25/week on comics back in the ‘80’s when I was in college. I have, I don’t know, five to ten thousand comics in my attic. I got out when they went up to $3 apiece. Way too rich for me. I pick up trades at the library now. Double odd because I have a good friend who is a pretty popular writer for DC, Marvel, and Dynamite. Agents is just fantastic. It was a long time building but worth it. And I appreciate them taking the time needed to do it right, not rushing. Let’s start out with you telling us about 9 Kingdoms. Ivan: 9 Kingdoms was originally the name of a miniatures game system that I was working on. When I started working on ApocalypZe, I was working with one of the guys (Pete Spano) who’d helped me develop the miniatures system and we agreed we liked that name for the company. The evolution of the company is very much tied in with the evolution of ApocalypZe. Right away, we needed to bring on an artist. We met Chris Hanson, who drew most of the images for the game, and became a critical member of the design team. When it came time to incorporate and Kickstart the game, we brought on Neil Hoffman. Neil had been a partner of mine in the comic book store. He possesses all of the business and financial skills that we creative types can’t seem to muster. Tom: I’ve not heard of the Nine Kingdoms minis game. What’s its status? Ivan: Sadly, it’s not in our pipeline. The game was extremely complex and required web support in order to play it. I had written a site that allowed you to create and update characters for the game (it’s a skirmish game). You could build squads and keep track of your characters online while playing. There were some very unique and fresh elements to the system that people loved, but I think its complexity pushed it out of the marketplace. That’s not to say I’ve given up on it. Over the past several months, in my limited free time, I’m working on adapting the system so that it works with cards instead of the web site. I’ll probably be testing that at conventions in 2015, just as a preliminary step in order to gauge interest. Tom: Your first game was ApocalypZe. Tell me what it is about. Ivan: ApocalypZe (pronounced apocalypse) is a card game where each player constructs his or her own 60 card deck. The box comes with 4 preconstructed decks and a pack of 64 additonal cards. The decks are composed of a variety of cards that help you scavenge for supplies and attack your opponent. Each player starts with a stronghold. This card goes right onto the table and it’s your job to protect it. 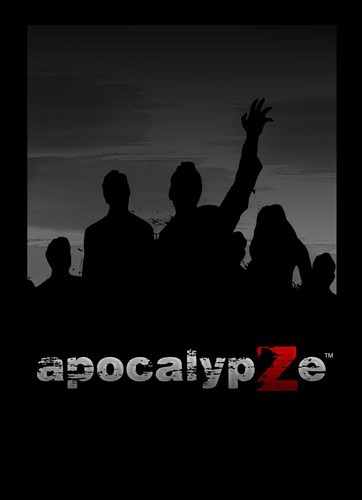 At its core, ApocalypZe is a game of survival and resource management over combat. In the original version of the game, the winner was the last man standing. In a revised version (rules available online), your survivors can take a more proactive role by scavenging a stockpile of supplies. You can win the game by building that stockpile up to a certain level. I could actually go on about Apocalypze forever. Pete, Chris, and I worked so hard on it for so long and were really happy with the results. That doesn’t mean we didn’t make some mistakes when it came to final product, but overall ApocalypZe was pretty successful and a great launch for our company. Tom: So when the second edition comes out, what will you improve? Ivan: The first thing we need to improve is the rulebook. The general consensus about our rulebook was that it was poorly constructed. I’ve revised it 3 or 4 times since the game came out and posted the revised rulebook on the website. I will continue to revise it as feedback comes in and then send it out for editing when the time comes. The next thing I wanted to change was the card design, and I’ve done that. People can see the new cards on the ApocalypZe or 9 Kingdoms facebook pages. I didn’t make any tremendously overt changes, but there were a few things that bothered me. I was able to enlarge the text and take out the gradient coloring that made some of the words difficult to read. I’m pretty happy with the new design. Because of the nature of this kind of game, players will always find loopholes and break cards. We tested the stuffing out of ApocalypZe and still there were a few cards that came up broken. 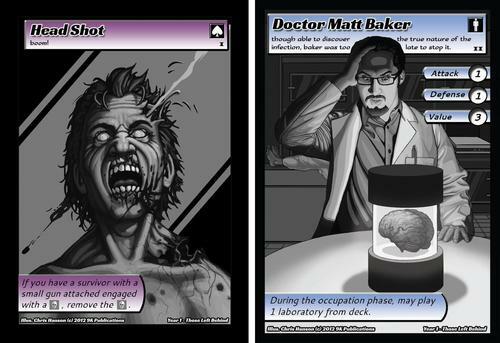 We’ve released some errata to help ease the pain (it’s only a handful of cards). Some of those cards won’t be reprinted. Others that are will include the corrections. The biggest change to the game will be the ability to win through scavenging. In the original rules set, a player can scavenge cards back from his or her discard pile in order to stay alive. Chris, Pete, and I have been working on making scavenging a more crucial part of the game. The rule has been added to the current edition of the rulebook, but I would consider it to be in the beta stage. I want to get more feedback from players over the course of the next several months before I commit to it. Tom: This genre is pretty saturated. Why did you choose to do another zombie game? Ivan: Fads are like plagues. Somehow, everyone seems to be doing the same thing at the same time until it boils over. When we started working on ApocalypZe, there was no Walking Dead TV series, there was no Zombicide, and there was no Zpocalypse. We chose the genre because we love the genre. I’ve been into it for years, painting dozens of zombies for my undead army in Warhammer. I’ve even authored an ebook series called Zombies! which ran monthly for two years and became very popular. Chris and I are both huge fans of Night of the Living Dead and there’s so much of that movie’s influence in the game. By the time ApocalypZe was ready for reviewers, we found ourselves in competition with a horde (pun intended) of other zombie games. We talked about changing the theme and altering the rules, but the truth is that we didn’t want to. 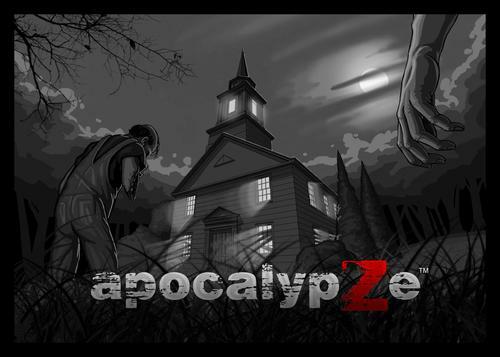 As we explored the market, we found that ApocalypZe really does stand apart from the other games just by dint of the fact that it’s not about stomping all over zombies. You don’t even have to use zombies if you don’t want to. There are other post apocalyptic nasties in the game such as gang members and cultists. Our early reviews helped us to spread the word about this. The first reviews went up on Carboard Jungle and Not Just Another Gaming Podcast and both of them highlighted the fact that ApocalypZe was very different from other games of the genre. 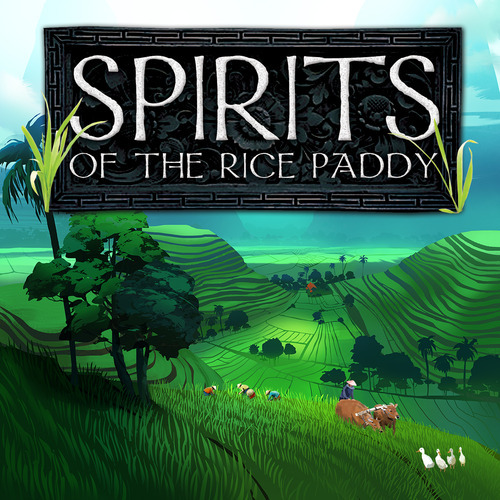 The game is very thematic and has its own back story. We published a couple of those stories in ebook format and distributed three others to our kickstarter backers. I’ve actually written (I think) seven of them. One of these days, I’ll actually tie them all together and wrap them up into a novel. Tom: Plagues is a nice choice of words. Ok, we need links to Zombies! and a bit more info on it. I’m convinced that ApocalypZe is unique. The fact that you don’t have to have zombies does that in and of itself. Can you expand on those differences? You need to get that ebook together. Ivan: If you get me started talking about Zombies!, I will go on forever. You’ve been warned. The home of Zombies! is Smashwords (https://www.smashwords.com/books/view/25202). Smashwords is the premiere site for self publishing ebooks. They sell your stuff on their site and distribute your books to Barnes & Noble, iTunes, and all of the other ebook sellers (except Amazon, who has their own self-publishing site). Zombies! is not related to ApocalypZe in any way and I was very careful to make sure there are actually no crossover references (no matter how often Pete told me I should link them). When I sat down to make ApocalypZe, I started thinking about what life would really be like for the survivor of a zombie apocalypse. It’s well represented in the best of the literature and I wanted to get that feel into the game. The primary goal is always survival. You need to hunker down, fortify your stronghold, and scavenge for supplies. Those are the elements I wanted to put into the game. In addition, without government and law, you’re going to wind up fighting more than the undead. You’re going to fight each other. This is the oldest concept in the genre. If you watch Night of the Living Dead, it’s really about the breakdown of the interaction between the survivors. We represented this in the game by making Gang and Cult raider groups, character cards that could only be used for attacking your opponents. In the future, we’ll expand on this by making raider versions of some of the survivor characters as well as survivor versions of some of the raider characters. This will allow players to have all of their survivors and raiders interacting on the table. Tom: There are several other games listed on your website. Talk a bit about each of those. Ivan: After ApocalypZe, we started to expand our thinking. If we wanted to be a legitimate game company, we needed to turn out more than just one game, or even one type of game. Starting in the more recent past, this is where Doug Levandowski comes in. 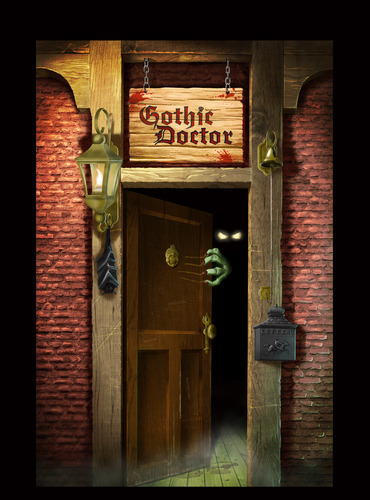 Doug and I became friends when he was running his first Kickstarter attempt with his game, Gothic Doctor. Doug is a completely different kind of gamer and designer than I am. Though his first attempt with Gothic Doctor didn’t fund, he chalked it up to a learning experience and absolutely crushed his funding goal on the second attempt. He and I talked about doing something together here and there until, ultimately, we invited him to join the company. Doug is currently responsible for Krampus, which is available through Gamecrafter. He’s also introduced two more games into our pipeline and has been helping to develop the games that were already there. Keep Calm is a party game that we’ve all been working on together. It plays in the tradition of many of the best party games, but its originality is in the cards. It’s still in early tests, but it’s generally received with howling laughter. 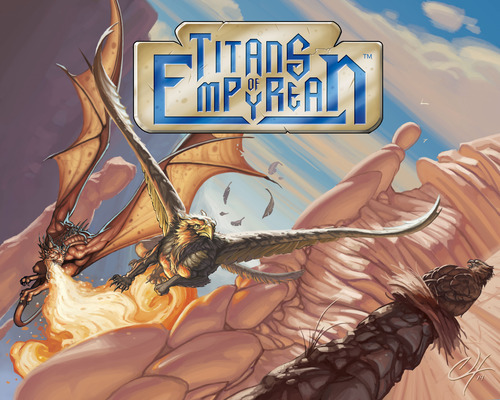 Our primary project right now, though, is Titans of Empyrean. I introduced this game to Neil shortly before ApocalypZe went to retail. It was pretty rough, but he liked it and thought it was worth pursuing. It’s a cross between a board game and a card game with its major draw being that it’s almost entirely strategic. There are no dice rolls. Each player commands a squad of 4 mythical flying creatures (dragons, pegasi, manticores, griffons). In addition to maneuvering your titans around a hex board in order to gain the advantage and attack, each unique titan has its own stack of maneuver cards. These cards serve as both the titan’s special abilities and its health. Titans of Empyrean is a combat game. The object is to destroy your opponent. But with the use of the maneuver cards, players are forced to make careful tactical decisions and manage those dwindling resources as the game progresses. We’ve been building Titans for about a year now. All in all, Titans is just about ready to go. The rules are solid. It’s not difficult to learn. The game plays in about 30 minutes and will come with a board, hex tokens, and over 200 maneuver cards. The artwork isn’t complete yet, but the pieces are coming in regularly. 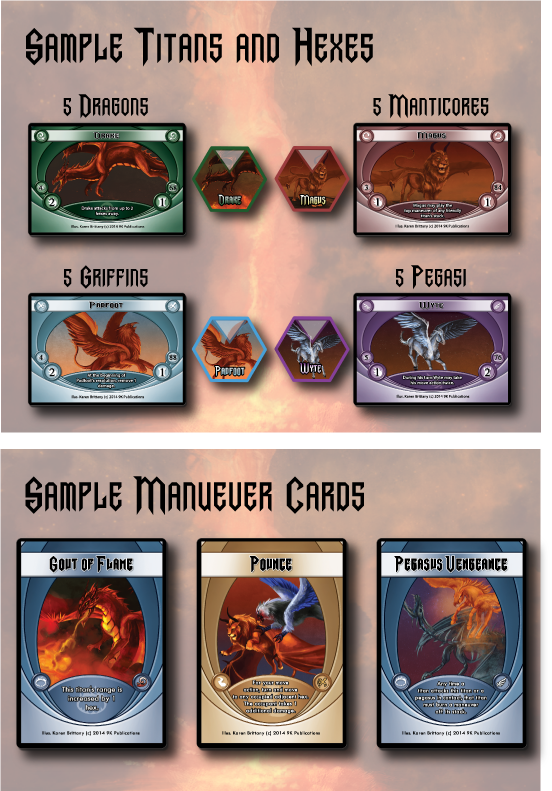 All in all, Titans of Empyrean will be ready to go to the printers by the time we launch our Kickstarter campaign on February 17th. Tom: February 17th isn’t that far away. Cool. Let’s hear more about Krampus. Doug: Krampus is a re-skinning of a game that’s been remade almost as much as zombie games – Werewolf. Unlike Ivan with ApocalypZe, though, I was really late to this game. For my holiday party last year, my wife suggested making a Christmas version of Werewolf involving those delightful Christmas demons, the Krampusz. (I found out that’s how the Austrians pluralize it during my little bit of research into the game.) So, basically, there are little children playing innocently, but they can tattle on other players to see if they’re a Krampus or not – and each night, the Krampus carry one child off. Andrea and I also dug into some of the Christmas stories to come up with the special roles for characters like Santa, who can protect a player with milk and cookies, or the Elf, who can sit on a shelf and find out one players role each night. We really liked how it turned out, so in September, we commissioned some work from Ruth Ducko, originally just to have for ourselves and to give to friends, but we loved her work so much that I talked to Nine Kingdoms and said, “Guys, I need to put this out!” We agreed that, with the pipeline as stuffed as it is and how time-sensitive a holiday-themed game is, The Game Crafter made the most sense, so it went up there in late November. I’ve also run two Facebook-based games of it. The second one came to a close a few weeks ago, and it was a hell of a lot of fun. Tom: Now let’s talk about Keep Calm. We’ll leave Titans until last. Ivan: Ever since the beginning, Neil’s been on my case about making a party game. Party games are fun and appeal to a much more diverse crowd of people and he’s felt, and rightly so, that 9 Kingdoms should have one (or more) on its resume. I have found that party games follow the same general formula so I didn’t want to deviate from that too much. Like so many others, the game is in the cards. 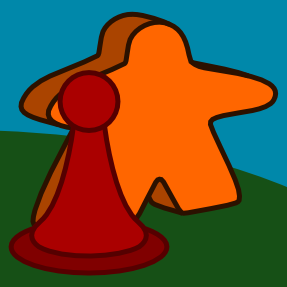 Keep Calm offers players a variety of situations ranging from the fairly regular to the surreal. Once a situation is presented each player has to play a card that says what he or she would do in that situation. Ivan: This card has turned out to be a fan favorite. You get the picture. Whichever Keep Calm card the judge picks gets the point and the opportunity to be the next judge. The game also comes with PANIC cards, which a person might play if he or she just cannot keep calm during that particular situation. A PANIC card will have an effect on all players for that round. Keep Calm is an adults only game so some of the cards can be profane or raunchy or moderately offensive to regular human beings. Tom: That sounds pretty fun. It will be a hit at cons I bet. Now more about Titans please. Ivan: Titans of Empyrean is an idea I had for a simple card game where players could throw mythological creatures at each other in a duel to the death. I started working on a layout pattern for the cards and some different ideas for which cards could attack and when. It was all looking too much like games that are already out there so I scrapped the layout idea and put the whole game on a board. In Titans, each player takes a squad of 4 creatures. There are 4 factions to choose from, including dragons, pegasi, manticores, and griffons. Each titan has a card which outlines its abilities. There are some basic stats for each of them and then some card text that makes it special. Each titan also has a corresponding token, which gets placed onto the gameboard. What makes the game interesting is the maneuver cards. On the surface, a maneuver card has some text on it that lets you do something special with your titan during its turn, however, they serve a much larger purpose during the game. Each titan will get its own stack of maneuvers. The number of maneuvers in the stack depends on the titan. Each player will also have some extra maneuvers in a reserve stack. During a titan’s turn (the game goes from titan to titan rather than player to player), a titan can play the top maneuver off of its stack. Some of them stay in play and some of them have an immediate effect and go to the burned (discard) pile. You can later replenish these from your reserve stack. As your titan gets damaged, you will be forced to burn (discard) maneuvers in order to heal up. If you can’t burn maneuvers, your titan will die. So, as a result, resource management is as much a factor in the game as combat tactics. The thing that makes Titans of Empyrean special, in my view, is that is completely customizable and extremely strategic and tactical. There are no dice rolls. The entire battle comes down to how you move your titans and use your maneuvers. Depending on how you set up the game, you can remove every bit of randomness. We’ve played games where we shuffled up our deck of maneuvers and dealt them out to our titans and games where we’ve picked and chosen the maneuvers for each titan and placed them in the order we wanted them. This variety of gameplay really excites players. We ran the game several dozen times at Gencon and the only guy who walked away with a frown was the guy who enjoyed the game right up until the point when he started to lose. Tom: That’s does sound unique. I’m interested in the mechanics. What type of maneuvers are there? How is all works together? Give us an idea of how the game actually works. Replenish by moving the top maneuver from the reserve stack to the bottom of its own maneuver stack. Obviously, there are rules for how movement and attacks are conducted, but they’re relatively simple mechanically speaking. The fact that you can do them in any order is what makes the tactics so interesting. If you’re out of range, you can move first and then attack. On the flip side, if your move (which is mandatory) will take you out of range, then you can attack first. You can play a maneuver early to enhance your attack or late to ensure your escape. There are 2 types of maneuvers. Active maneuvers stay in play (unless replaced or discarded). Burn maneuvers have an immediate effect and are then discarded. An example of an active maneuver is the Strength card, which gives a titan +1 strength. An example of a burn maneuver is Out of the Smoke, which allows a titan to attack any other titan anywhere on the board. Once again, when (if) you choose to play your maneuvers is tactically critical during the course of the game. Since you can play either the top one off of the titan’s stack or the top one off of the reserve stack, you always have 2 choices. Under certain conditions, you can replenish first, which changes the top of the reserve stack and gives you an alternate option. When titans are attacked, they receive damage tokens. The damage doesn’t mean anything right away. After all of the titans have taken their turns, players move into the Resolution Phase. During this phase, each titan needs to remove the damage tokens by burning maneuvers. There are 3 ways to do this, but if a titan can’t burn enough to remove excess damage, that titan is dead. Tom Do you have anything else in the works? Ivan: Right now we’re focused on Titans and Keep Calm. Each of those is going to require a Kickstarter campaign. Long range, we have a card game called You’re Fired that Doug designed. It’s done very well in play tests and we think it’s just about ready to go. Beyond that, there are several design ideas that we’ve been kicking around and we hope to eventually broaden our horizons by publishing games from other designers. We’ve talked to a couple, but I can’t say more about that right now. Tom: Do you have any questions for me? Ivan: I’m sure you play lots of games in order to keep yourself well rounded, but what’s your game (or type of game) of choice? Tom: Right now there are several – Takenoko, Sentinels, and Hive. 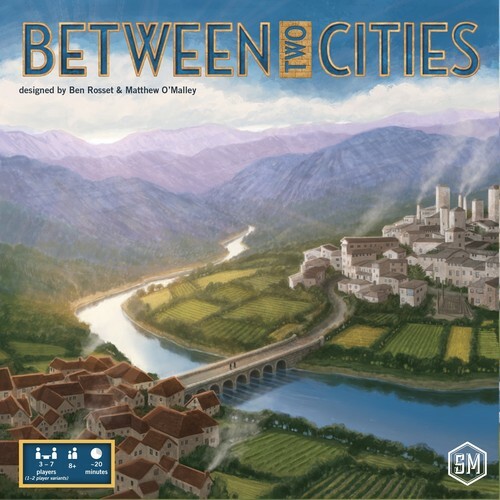 I’m a big Stefan Feld fan so my all-time favorites are Macao and The Speicherstadt. I also really enjoy The Manhattan Project, Memoir ‘44, and DC Deck-building. I really like rpg’s when I can get them. Doug: What games pleasantly surprised you this past year? Tom: The biggest surprise was Mob Town from 5th Street Games. It’s not out yet but it’s really fantastic. We have played A LOT of it. Practically worn out my prototype copy. You can learn more about it here. Both of you, other than the usual ‘playtest the heck out of your game’, what one piece of advice would you give a new game designer? Ivan: We do a lot of conventions and we meet aspiring game designers all the time. It doesn’t feel like it’s been that long since I was the guy asking everyone for advice (that may be because I still am), but if I had to sum it up, I would put it like this: Know what you’re getting into. Once you get past the thrill of expressing your creativity, you have to deal with setbacks and criticism. Ultimately, money will become an issue as well. Unless you have disposable cash to throw at your game and you don’t care about being in the red, you need to keep track of every one of your costs. Making a game is fun. Publishing it is business. Tom: Excellent advice that many people do not think about. Game designing is very romanticized by those who are not actually doing it. It takes a lot of time and money, sweat and tears. Tom: GD is a pretty good game. Thanks for letting me playtest/review it. My son and I enjoyed it. Doug: Thanks! I’m glad you guys enjoyed it! It should be out in a few months for people to buy – once we fulfill to Kickstarter backers, of course. Just approved the proof sheets recently. It’s very exciting!! Tom: Any final words or comments? Ivan: I just want to say thanks, once again, for doing this. I did want to let people know that our kickstarter preview page is up at this link: https://www.kickstarter.com/projects/9kpublications/512892480?token=4cdd4aef. I hope everyone will go and have a look and leave some feedback. Tom: Thanks guys. That was a fun interview. Talk to you soon. I appreciate Doug and Ivan being my guests. Titans of Empyrean looks like a lot of fun. Be sure to watch for it on Kickstarter soon. You can learn more about Nine Kingdoms Publications right here. Zip on over and tell ’em Tom sent you. 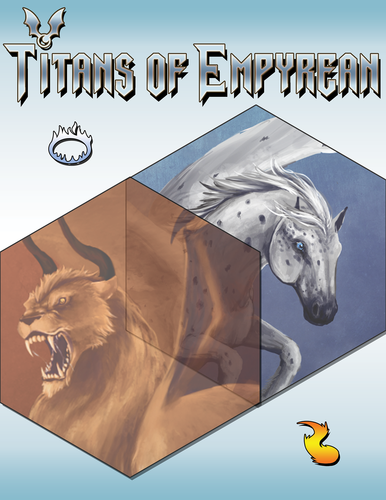 Here is the BGG entry for Titans of Empyrean. Inspired by my fellow interviewer, The Inquisitive Meeple, I’ve decided to post a list of the interviews I’m working on. Jamey Stegmaier, who actually interviews me! And I have more on the wish list. It’s a busy but great time at Go Forth HQ.